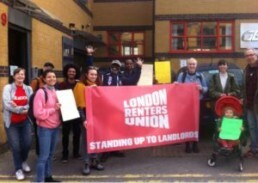 London Renters Union are a members-led, campaigning union and who are taking action to make sure all Londoners have a decent, affordable and secure home. Join the community today and become part of the movement to transform the housing system. The Hackney Branch of the London Renters Union meets at the Round Chapel Old School Rooms every month. If you live in Hackney and are facing a housing problem or would like to get involved with the union, join this open meeting where together we can support each other in claiming our housing rights. Food, tea + coffee will be provided. Get in touch if we can help make it easier for you to attend.